S. Korea won Bronze by defeating U.S.A. 14-6. China and Czech Republic were equal 5th, followed by Mexico and France. 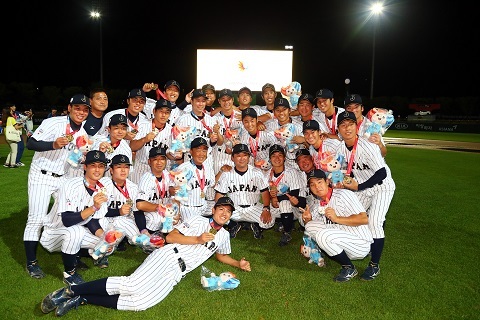 In spite of delaying the start of the final game for 2 hours on July 11 night, rain prevented Chinese Taipei and Japan from playing the final game and both teams shared Gold Medal. According Yonhap News, losing manager Lee Kun-yol of South Korea lamented the shallow talent pool at the collegiate level as his team meekly bowed out of the semifinals in baseball at the Summer Universiade. South Korea lost to Chinese Taipei 2-0 in Friday's semifinals, and was relegated to the bronze medal contest against the United States later Saturday. South Korea mustered five hits and was struck out 12 times against two Chinese Taipei pitchers. 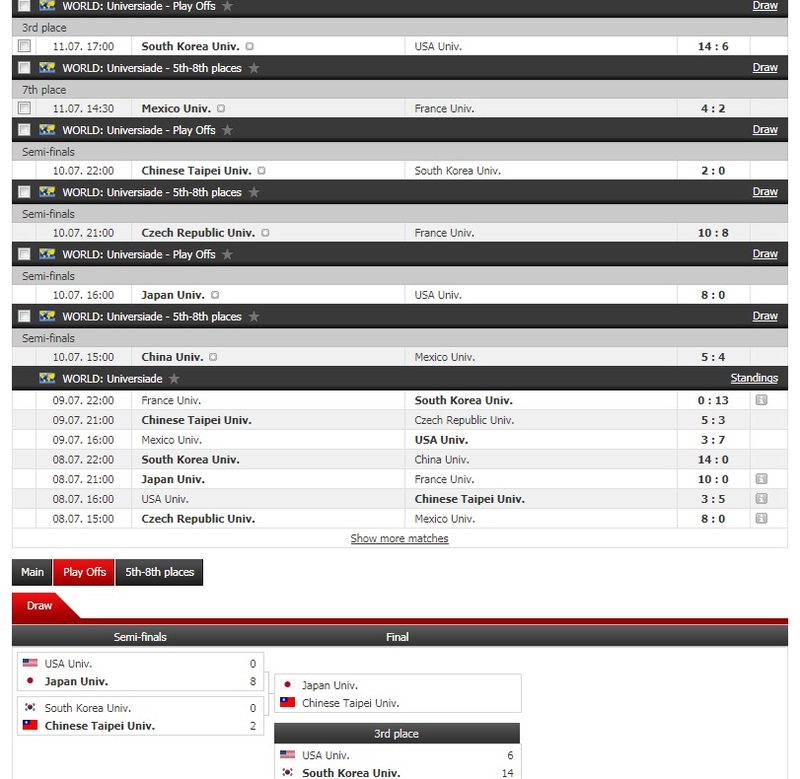 Lee's team also wasted a handful of scoring opportunities, as Kim Ho-eun and Kim Ju-hyun, the No. 3 and No. 4 hitters, combined to go just 1-for-8 with four strikeouts. Right-handed starter Sung Chia-Hao held South Korea to three hits over 5 1/3 innings, but it was the left-handed reliever Lin Tzu-Wei that gave South Korea more trouble. Lin worked around three walks to strike out seven batters in 3 2/3. South Korea had seven left-handed batters in the starting lineup and Lee said he would've liked to have more right-handed batters. "The problem is elementary schools force kids to switch from right to left (in the batter's box)," he said. "It's difficult to find right-handed bats at the collegiate level." Lee said his team got some reps against left-handed pitchers in the lead-up to the Universiade, but it didn't have the desired effects because they didn't face any quality southpaws in practice. "All the good left-handed pitchers that come out of high school often go straight to the pros," Lee added. "I don't think the Chinese Taipei pitcher (Lin) had great stuff, but we just couldn't get to him.